New Zealand has some of the most beautiful scenery in the world, but this statement has never been truer than in the South Island area of Glenorchy. Nestled on the northern shores of Lake Wakatipu, just 45 minutes from Queenstown, Glenorchy’s spectacular landscapes have become a prime location for many films, including scenes from The Lord of the Rings trilogy, The Hobbit as well as featuring in the Narnia movies. 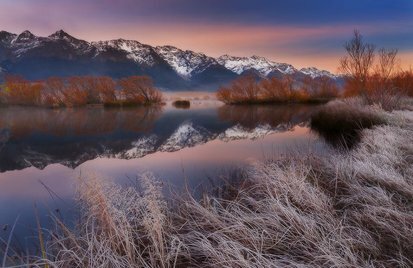 At Glenorchy Journeys we offer you the opportunity to experience a spectacular journey into the very heart of what nature has to offer with scenic tours on New Zealand’s South Island. We focus on your every need and want before you embark on this journey with us to make sure you are fully-equipped for adventure before you step into a car or onto a pathway. We offer you the opportunity to customise the experience of your dreams down to the very last detail with support from our experienced team. Explore majestic mountains and spectacular glacial valleys as part of a tour that perfectly suits your interests or the passions of your group—these sites and other beauties await you at Glenorchy Journeys. Enjoy a nature walk and experience the raw beauty of a famous World Heritage area with one of our guided walks across NZ’s South Island. Our guided walks are known for revitalising the soul. Whether it’s a passion for photography, birds, forests or fungi you will find enjoyment around every corner. Our privately-guided walks will allow you to journey at your own pace. At Glenorchy Journeys, we want everyone to be able to enjoy their time with us, so we make sure all our guided day walks are suitable for people of all ages and fitness levels. While on a guided walk, you will experience all the incredible South Island scenery has to offer, including the wildlife. The area boasts several songbirds such as the bellbird, the South Island robin, and yellow-crowned parakeet whose musical calls and chirps will accompany you as you make your way through ancient beech forests. We include transport to and from our guided tracks, so you are immersed in the wilderness yet always maintain your access to an easy return trip. If you want to enjoy all the sights we have to offer and travel in style, join us on one of our half-day tours. With beautiful mountain scenery and ancient beech forests calling to be explored, the opportunity to seize the day falls to you and your camera. If you crave even more exploration, enjoy a private full day tour, an option that is fully-customised to deliver a personal experience with your friends or family by your side. We arrange our tours to meet your interests, whether they include going for a more extensive walk or sitting back and enjoying the scenery or a bit of both. Our small group tours of New Zealand’s South Island provide a unique journey you will never forget. Book a tour with Glenorchy Journeys and prepare for the wilderness adventure of your dreams.